OverDrive | How do pinned carts work? You have to pin carts in Marketplace before you can add titles to them. You can create as many carts as you like, but you can only pin five carts at a time (per lending model). 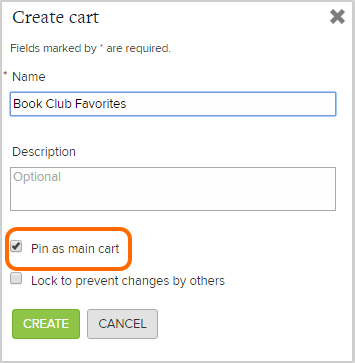 To pin a cart, select Pin as main cart when you create the cart. 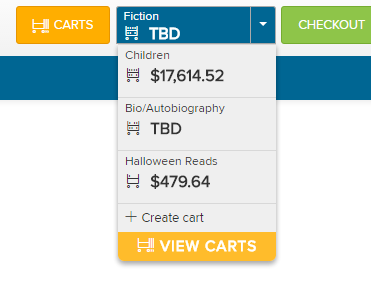 Or, you can pin a cart from the Carts page by clicking the thumbtack icon. 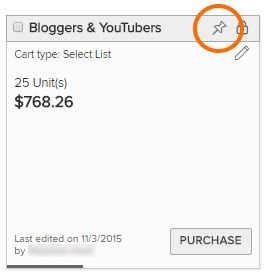 To unpin a cart, click the thumbtack icon again. You can select the pinned cart you want to shop in using the drop-down in the upper-right corner of Marketplace. Or, while viewing search results, click "add to main cart" to add a title to your first pinned cart. You can also choose a different pinned cart from the "add to main cart" drop-down.